What Does it Mean to Travel Consciously? 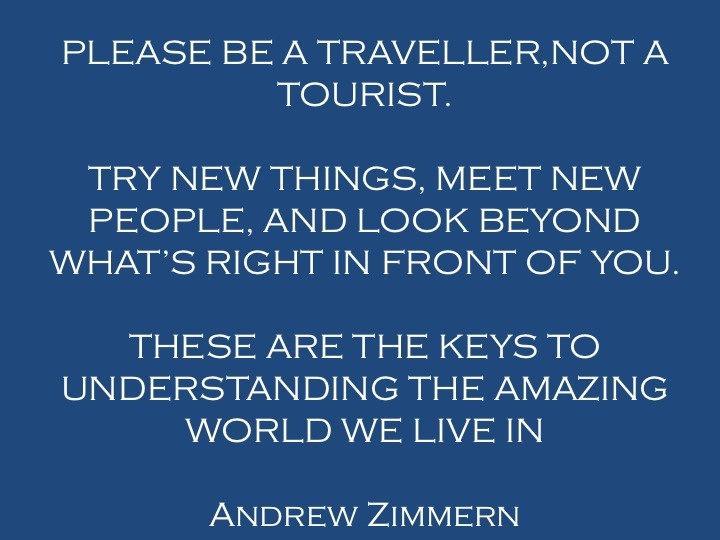 I am indebted to Whole Journeys for sharing this quote from Andrew Zimmern, chef, author, TV host. What does travelling consciously mean to you? Please complete this sentence: To travel consciously is to:…………..
To be a traveler, as opposed to a tourist is to travel with all your senses awake, aware and alert. To travel is to travel consciously –or not at all. To travel is to engage in an intimate conversation with the people and places you meet, constantly seeking to experience our world through a new set of lenses. To travel consciously requires first that you take out of your baggage as many pre-conceptions and predjudices and leave them at home. To travel consciously means leaving your adult self at home too – be as a chlld, full or wonder, and irrepressibly curious. To travel consciously necessitates that you slow down and focus on the small things. To travel consciously is to become a Sherlock Holmes – attentive to the detail, open to unexpected connections. To travel consciously is to look at the world as you would gaze at your lover seeking only his or her well-being and fulfillment. To travel consciously is to seek a place and host who cares. Do please add yours to this list here or on the Conscious Travel Facebook page…. Anna, I really liked this post and the inspirational, yet practical, nature of the challenges you pose. Enough to make us all think more consciously as we travel to the various places in our lives. Thanks Gina, as you travel south and if you think of some more, please add. Conscious hosts will also become conscious leaders in their community and the work of the Global INstitute on Conscious Leadership (www.gifcl.com) will be invaluable to this movement in the travel sector. To travel consciously is to…engage in a reciprocal relationship of care and love. What do I bring to share and what is there that my host person and/or place is sharing with me? An acute awareness of this. It is sitting down to the “great” potluck of humanity and sharing what we can while partaking of what is being offered. An exchange and appreciation of each other and our unique persons, places, cultures, etc. Yesterday I spoke with a group of teens I’m taking to Bimini to travel consciously and they said, “to be respectful of everyone and everything, to be mindful, to be kind”…out of the mouth of wise young ones. I agree! What a wonderfully inspiring post! 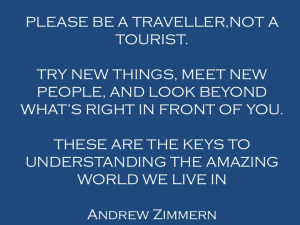 It really gives aspiring travellers food for thought about their next trip. The thoughts you’ve written here are exactly the kind of travel we’re promoting through encouraging home exchange – where you stay in a real home and experience new places from a local’s perspective.